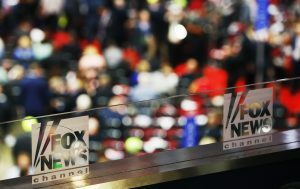 NEW YORK — The Democratic National Committee says it won’t pick Fox News to televise one of the upcoming debates being held for its 2020 presidential contenders. The party chairman, Tom Perez, says he’s concluded that the network isn’t in a position to host a fair and neutral debate. He’s citing a New Yorker magazine article released Monday that details Fox’s relationship with President Donald Trump. Even before the article, some Democratic activists were complaining about the committee’s consideration of Fox as a potential broadcast partner. The Democrats have announced 12 debates for later this year, with NBC News and CNN set to broadcast the first two. Fox says it hopes the Democrats will reconsider. Left: Fox says it hopes the Democrats will reconsider. Photo by Aaron P. Bernstein/Reuters.